Nikola Tesla is one of history’s most acclaimed scientists and engineers, a prolific inventor who transformed modern society. 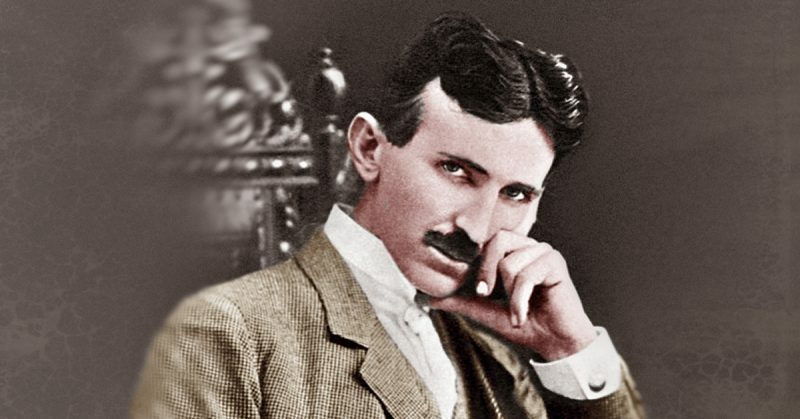 Tesla is most widely known for his contributions to the development of the modern AC electric supply system and as an early pioneer of many of the technologies that shaped the second half of the 20th century. Tesla was also an eccentric, known particularly for his showmanship, charisma, and talent when speaking in public. However, throughout his life he struggled with mental health problems, most notably, a debilitating form of Obsessive Compulsive Disorder (OCD). 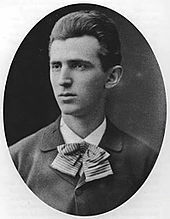 A photograph of Nikola Tesla (1856-1943) at age 40. Like many people with OCD, Tesla was particularly concerned with germs, cleanliness and avoiding disease. According to Smithsonian Magazine, he obsessively washed his hands, and in his later life ensured that all his food was boiled before he would touch it. He often refused to shake hands when he met someone, and usually wore gloves to avoid any physical contact with people he met. 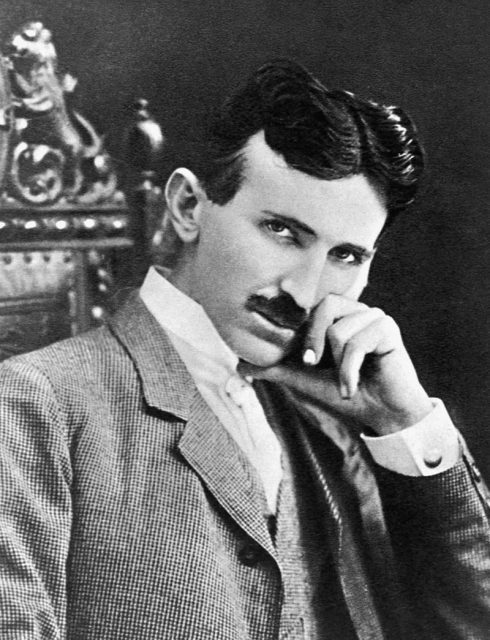 Tesla was also a famous night owl. He claimed to survive on just two hours sleep each night, although he often took short naps during the day too. He would work on experiments in his lab throughout the night, much to the distress of his neighbors, who were often kept awake by the strange noises that emanated from his house and regularly called the police out of concern for the famous scientist. 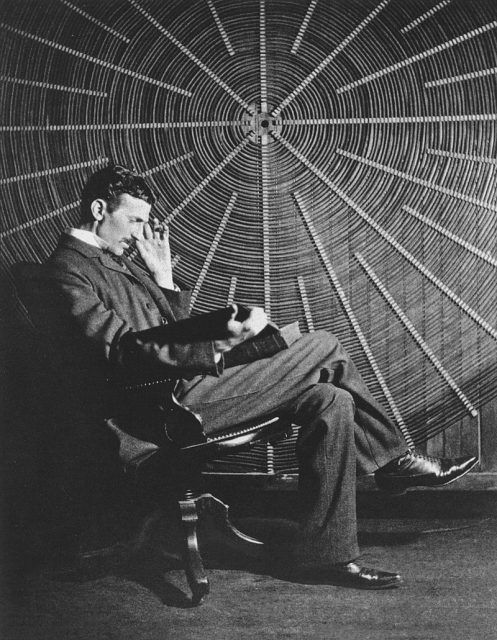 Tesla sitting in front of a spiral coil used in his wireless power experiments at his East Houston St. laboratory. His lab assistants reported that he would often become so fatigued through an intense period of work and lack of sleep that he would simply collapse in the middle of his experiments and fall asleep at his desk. This chronic insomnia is likely to have exacerbated his struggles with his mental health. Another one of Tesla’s particular quirks was a strange obsession with the number three. He would often engage in rituals that involved the number three, including his habit of walking three times around a building before entering it. 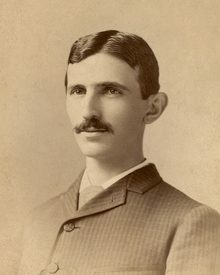 Tesla aged 23, c. 1879. When dining he would fold 18 napkins before he started eating because 18 was divisible by three. Similarly, when arriving at a hotel, he always requested that his room number was divisible by three and specified that he required 18 fresh towels to be delivered every morning. 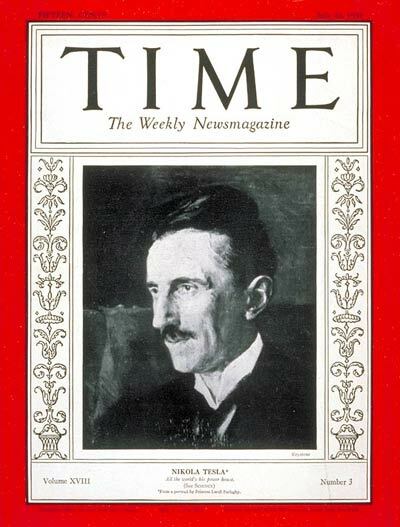 Tesla on the cover of Time magazine commemorating his 75th birthday. According to Smithsonian Magazine, in addition to boiling all of his food, he would also precisely determine the cubic mass of the food on his place, and then calculate the precise number of jaw movements required to digest it. He had a profound phobia of round objects, and could not remain in the company of a woman who was wearing earrings. While these strange habits and rituals may appear comical, they evidence a man struggling with serious mental illness. Unfortunately, Tesla was born in a time and society that did not fully understand mental illness and his struggles with his own compulsive behavior. 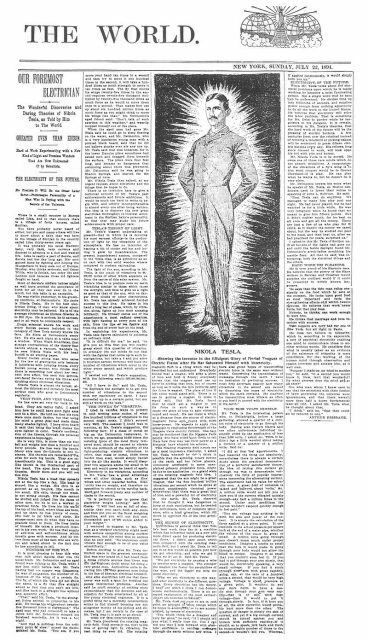 Article about Nikola Tesla, July 22, 1894. Furthermore, mental illness appears to have run in his family, with both his father and brother displaying symptoms of schizophrenia and personality disorder. His father was known to have intense and violent arguments with himself, incarnating different personalities, and his brother experienced frequent and violent hallucinations. 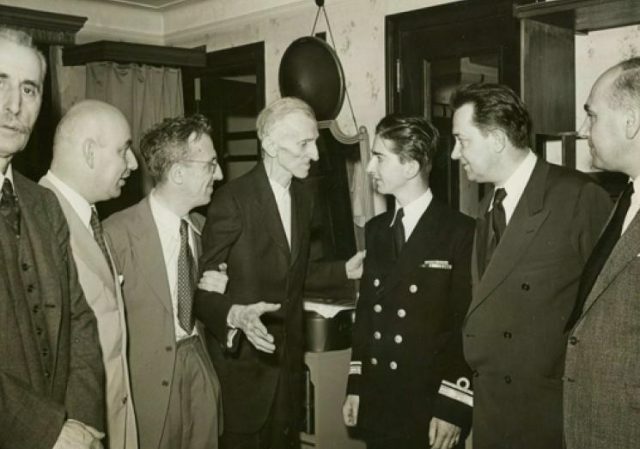 King Peter II and Nikola Tesla, Hotel New Yorker’s, June 1942. 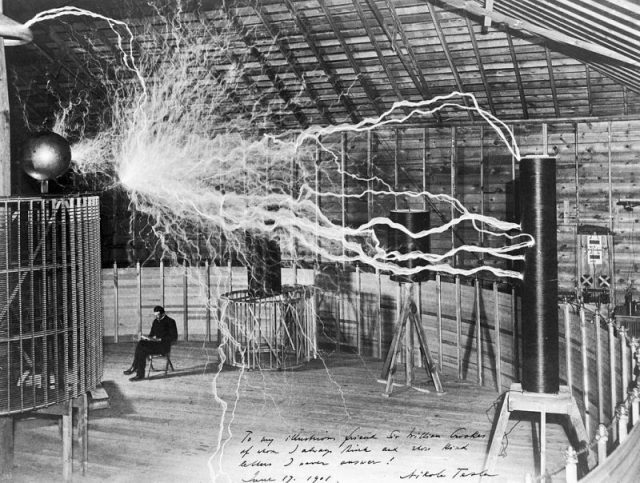 Tesla himself also reported experiencing hallucinations, although he also attributed many of his scientific successes to the inspiration provided during these experiences. His idea for the AC motor, for example, was apparently inspired by a hallucination of flashing light and flames. Mark Twain in the lab of Nikola Tesla, spring of 1894. 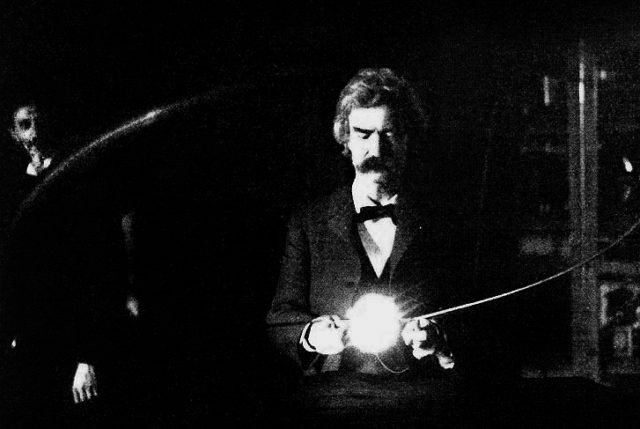 Twain is holding Tesla’s experimental vacuum lamp, which is powered by a loop of wire which is receiving electromagnetic energy from a Tesla coil (not visible). Tesla’s face is visible in the background. Tesla’s unusual habits and strange behavior were often minimized by his fans, who described them as mere eccentricities, and ridiculed by his critics, who considered him to be completely insane. Although today we might consider Tesla a profound genius afflicted by serious mental illness, during his lifetime, the stigma surrounding these conditions meant that Tesla rarely found the help and support that he needed. He died alone, in poverty and relative obscurity, a sad end for one of the most acclaimed inventors of the modern age.